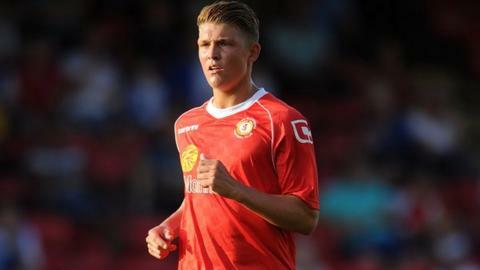 Teenage Crewe Alexandra striker Max Clayton faces a long lay-off after suffering a broken ankle. The England Under-19 international was stretchered off after a heavy challenge from Wycombe Wanderers defender Marvin McCoy in Tuesday's 2-0 FA Cup home defeat at Gresty Road. The club had hoped Clayton, 19, might have suffered only ligament damage. But a scan showed a break and he has undergone an operation, likely to keep him out for the rest of the season. Meanwhile, Crewe are hopeful that defender Matt Tootle, who has missed the last three matches with a foot injury, and young striker Ryan Colclough (hamstring) may be fit to figure in the selection process for this Saturday's home derby date with Port Vale.